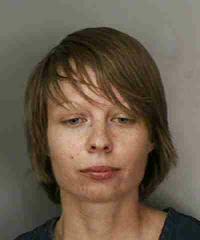 On Tuesday, April 2, 2013, Polk County Sheriff's deputies arrested 31-year-old Stacey Ann Fuchs after she illegally moved into a foreclosed home in Lakeland. The investigation began at the end of March, when Cynthia Westley, who had reached an amicable foreclosure agreement with her lender and voluntarily vacated her home located at 1600 Georgetown Drive in Lakeland, noticed that the locks on the house had been changed (Westley made frequent visits to the home to maintain its upkeep). On March 29, 2013, she noticed the locks had been changed and unfamiliar items had been moved into the house, so she contacted the lender, who told her they had not put new locks on the house and denied granting anyone permission to enter the residence. Westley then contacted PCSO. Deputies arrived on scene and made contact with 31-year-old Stacey Ann Fuchs of Lakeland, inside the home. Fuchs told the deputies that she had researched "Adverse Possession" on the Internet, and based on the information she found online, felt it was her right to move into the vacated home. She also admitted to changing the locks on the house. Fuchs was placed under arrest and booked into the Polk County Jail on one count Burglary and one count Grand Theft $100,000 or More. PCSO deputies previously arrested 40-year-old Lessie Hurd in a similar, unrelated investigation. On March 13, 2013, Hurd was arrested and charged with Scheming to Defraud, 2 counts Burglary, and 3 counts Grand Theft $100,000 or More, for changing the locks on different houses and claiming "Adverse Possession." She has since bonded out of jail.